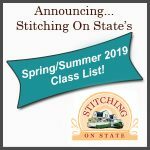 Have you ever taken a class at Stitching On State? Please do! You will make new friends, learn new skills and have a wonderful time. How could that be more perfect? Check on our Classes page for all our Classes, Clubs, Workshops and Events. You can sign up online for most classes-or you can download a hard copy of our class list if you prefer and register in person or over the phone.